It’s probably not your number-one bike related concern, but there’s no doubt the temptation exists to jump back on your bike after one or two pints or gin and tonics and head home instead of getting a taxi or taking the bus. 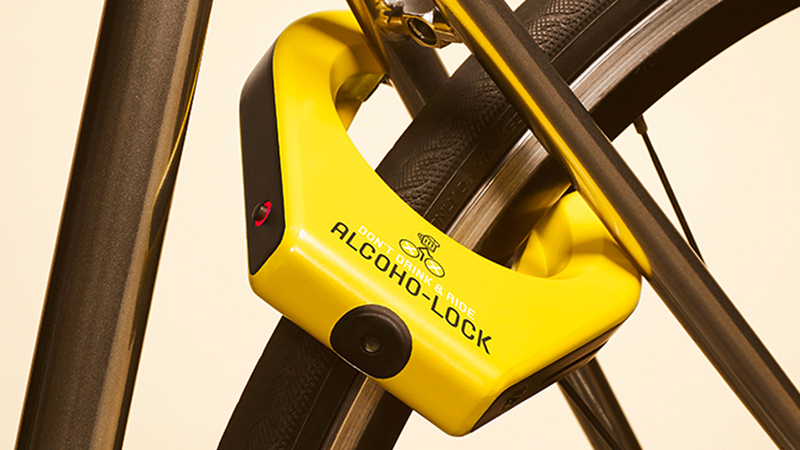 Riding on the road under the influence of alcohol is for sure a bad idea, and that’s what the new ‘Alcoho-Lock’ tries to combat. It works fairly simply; if it detects you’ve had too many after you’ve breathed into its sensor, then the lock won’t open and it’ll ping a notification to someone you know via the app its paired with on your smartphone. They’re then there to convince you not to ride, according to the inventors, while they also have the power to unlock your bike remotely if they choose to, allowing you to push your bike home (although how you’re supposed to trust a drunk person to do that, who knows?). There are a few glaring issues with the system though, despite its noble intentions. Firstly, you need a data connection to be able to unlock it, which if missing, means your bike is going nowhere. What happens if your nominated unlocker isn’t a wake, or their phone is dead? You’ll then find yourself leaving your bike wherever it happens to be locked. The only way around that is to be able to bypass the whole system, unlocking it yourself, which would seemingly make the concept fairly redundant and definitely something a drunk person with the intent on cycling home would probably use. The other issue is, it’s retailing at around £200, which is a lot to shell out for a bike lock no matter how good the idea might be.